It’s that time of year when turtles may be seen more frequently. Irresistible as turtles may be, the Maryland Department of Natural Resources urges people to resist the temptation and to leave these reptiles in the wild. Helpful Marylanders do sometimes move turtles off roads to protect them from traffic. This should only be done with extreme caution, and the turtle should only be removed far enough to be out of danger. That should be the extent of human interference. There are no good outcomes to removing a turtle from the wild. Baby turtles are cute but they become big, can live for decades, and may outgrow their aquariums or other artificial habitats. Captive turtles often do not survive being released into the wild and released pet turtles may introduce diseases into wild populations, especially if they were kept in a home with other animals. Written authorization is given by the Maryland Department of Natural Resources. People who are interested in keeping a turtle as a pet can obtain more information from the Mid-Atlantic Turtle and Tortoise Society, which provides opportunities to adopt turtles and tortoises that cannot be released into the wild. 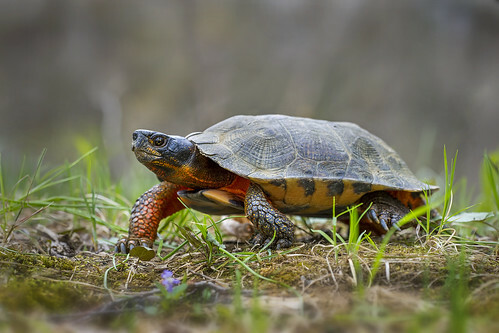 The rules and regulations surrounding the taking and keeping of turtles and other reptiles as pets are designed to protect native wild populations and prevent the spread of disease. More information about permits for captive reptiles and conditions for release into the wild, as well as species lists, is available here. Why Do You Want a Pet? Can You Afford It?